Waterpik Sidekick Water Flosser Review (WF-04) – Hit or Miss? Waterpik has a growing catalogue of water flossers targeting people on the go. First, there’s the WP-300 (Waterpik Traveler). Then, there are several models of cordless oral irrigators such as the WP-560. Now, there’s the WF-04, also known as the Sidekick. It’s an “ultra compact,” collapsible, take-me-anywhere design with the same patented technology that the brand has used in its countertop units. Is it a hit or a miss? This Waterpik Sidekick water flosser review should provide the answer. – Collapsible. The best feature of the Waterpik Sidekick is its collapsible and compact design. The power supply has its own storage within the base of the unit, and the reservoir contains and keeps the base intact. A travel case is provided for traveling. See image on the right. – Lightweight. Not only is this compact in design, but it’s also lightweight. As advertised, it weighs only 1.05 pounds (0.478 kg). – 60-Second Flossing. The Sidekick‘s water tank can fill up to 13 ounces (or 400 ml) of water. It’s obviously not the largest reservoir on the market, but it should give you a minute (or 60 seconds) of flossing time. – Other Features. There’s only 1 flosser tip included. At the base, there’s a knob that lets you choose among 5 pressure settings. Enjoy 14000 pulses per minute while you floss. – Convenience. The Waterpik WF-04 does serves its purpose. It’s an “anywhere” water flosser. It fits nicely in your countertop, and it easily and quickly breaks down so you can take it with you when traveling. – Size. Its small size is perfect for small sinks, bathrooms with limited counter space, and carry-ons. – Power. Several buyers say that the Sidekick is more powerful than the battery-operated, handheld models. Compared with other countertop models, it’s comparable in power. – Limitations. 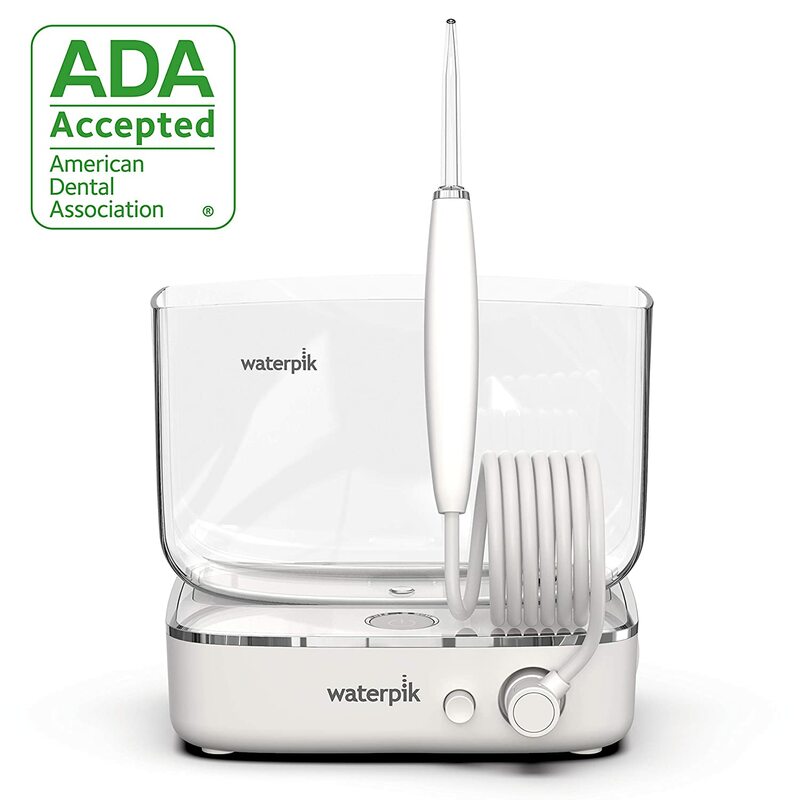 The Waterpik Sidekick is very simple to use, but one of its disadvantages is that it doesn’t come with advanced features compared with other models such as the Waterpik Aquarius. The Sidekick (WF-04) doesn’t have a timer. It doesn’t have a massage mode. It doesn’t have an LED function indicator. It doesn’t come with a cover for its reservoir. It’s not shower safe. Unfortunately, the case doesn’t protect the tip of this flosser. And considering that the Sidekick only comes with one tip, this can be such an inconvenience when it accidentally breaks when traveling. Some people say that the power cord is short. 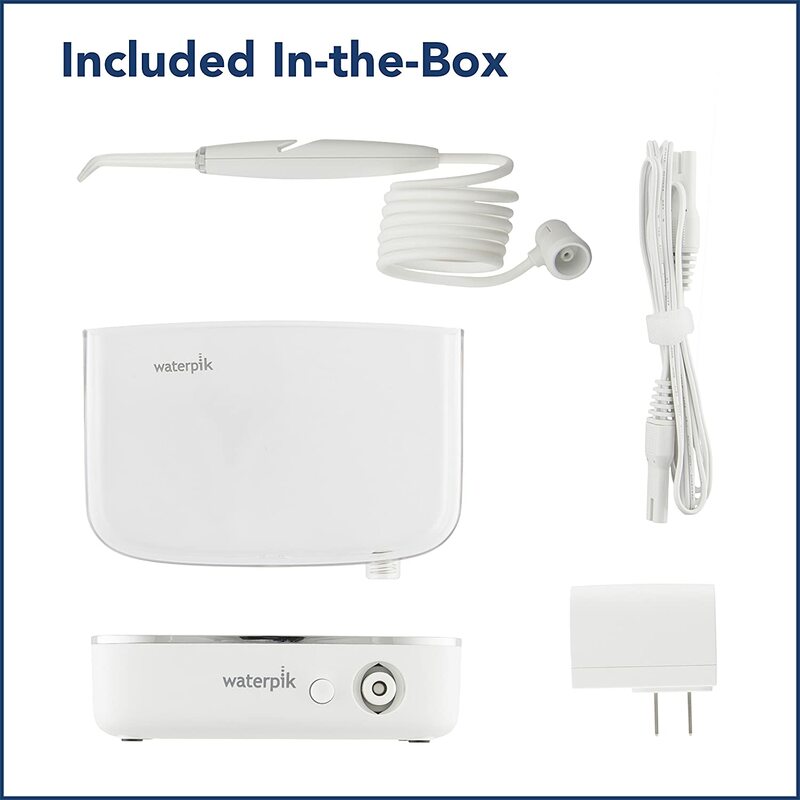 Let’s end this Waterpik Sidekick water flosser review with our recommendation. The Waterpik WF-04 is almost perfect. Its collapsible design is a big plus, which makes it ideal for people who are always on the go. It’s more powerful than the handheld, and it’s small and light enough to fit into your traveling bag. One, only the base is encased by the reservoir, leaving the tip unprotected from possible damage. When the tip breaks, the Sidekick becomes unusable because it only comes with one tip. You can use this at home, but another gripe is the reservoir’s lack of cover. Dust and other particles can easily get into the tank. Still, we say that the Waterpik Sidekick is a good purchase especially for travelers. But find a way to protect the tip. Waterpik WP-100 vs WP-300: What’s the Difference?